The Patiala police is finding “gaps in the testimonies” of complainants in the human trafficking case registered against pop star Daler Mehndi even as it has been forced to reissue notices under Section 160, CrPC, to complainants who have still not appeared before it to corroborate their allegations against the pop star. At least 26 persons were injured, 10 of them seriously, in a head-on collision between two buses on the Kharar-Ludhiana road early this morning. Mangled remains of the Punjab Roadways bus that met with a head-on collision with another bus from the opposite side injuring 26 persons near Morinda on Monday. — Tribune photograph by Pankaj Sharma. Vocalists, Rajan-Sajan Mishra and Manjiri Asnare Kelkar captivated lovers of classical music on the concluding day of the Shri Baba Harballabh Sangeet Sammelan here last night. 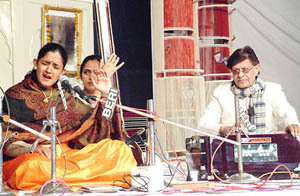 Vocalist Manjiri Asnare Kelkar, accompanied by harmonium player Mohan Malsiyani, performs on the concluding day of the Harballabh Sangeet Sammelan at the Devi Talab temple in Jalandhar on Sunday. The District Congress Committee here held a function here yesterday to celebrate the 118th foundation day of the Congress party and vowed to strengthen secularism in the country. Praising the party’s role in development in different, fields the speakers hailed AICC president Mrs Sonia Gandhi’s proposal to leave 140 seats for alliance with secular parties to oust the BJP-led NDA government. Capt Amarinder Singh, Chief Minister, Punjab, today released Markfed calendar and diaries for the year 2004. Mr Parkash Chand senior Congress leader and member of the Improvement Trust here yesterday expressed concern over the non-payment of old-age, widow, handicapped and other pensions to more than 5 lakh persons for over six months. A young man and a beggar woman died in the city today due to cold, prevalent gripped in the region for the past two weeks. Traffic near Naushehra Pannuan village remained suspended for more than five hours yesterday morning when more than 12 four-wheelers, including two buses, collided on the GT Road due to fog. 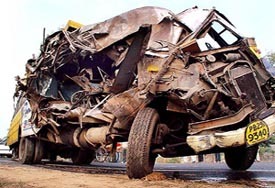 Though no loss of life was reported, vehicles were damaged badly. The Punjab Government has planned a month-long campaign to eradicate the foot-and-mouth disease in eight districts, including Bathinda. Hundreds of activists of the BKU (Ekta) today sat in dharna in front of the office of the Deputy Commissioner here today to press the Punjab Government to make arrangements for checking the menace of stray animals. They also sought to withdraw cases registered against a section of farmers for their involvement in the transportation of stray animals from their villages to abandoned areas. Taking a serious view of the issue pertaining to Municipal Corporation, officials, who allegedly connived with two private telecom companies to cause loss of revenue to the tune of Rs 6 crore, the Mayor, Mr Surinder Mahey, today constituted a five-member committee to probe the allegations. The district administration would launch pulse polio campaign in the district by setting up 535 special polio camps on January 4 and February 22. Pulse polio drops would be administered to children between the age group of 0 to 5 years. Municipal councillors belonging to the Opposition today raised slogans against the president of the Nagar Council, Mr Narinderjit Singh Bhatia, for cancellation of the monthly meeting of the council. An employee of the Food and Civil Supplies Department was today caught red-handed by Vigilance Bureau officials here while he was accepting Rs 1800 as bribe. Harish Mahajan, area sales manager of a company, alleged that he was robbed of Rs 5,000 and a watch by three blanket-wrapped persons at knifepoint early this morning while he was going to the railway station to board Shatabdi Express. He said the general railway police directed him to get a case registered with the police. He alleged that despite repeated attempts, the police control room, a 24-hour service, no case had been registered. Strife and controversy returned to Punjabi University after a lull of one year seeing a month-long student agitation, bitter animosity between its Vice-Chancellor and Pro Vice-Chancellor, with the former even recommending the removal of the latter, and suspension of senior teachers. A compilation of nearly 38 Hindi poems written by the Deputy General Manager, State Bank of Patiala, Mr N. S. Deshpande, was released today at the Punjab Bhasha Bhavan here. The book titled `Aahat` was released by Dr Madan Lal Hasija, Director, State Languages Department, amidst a `Kaavya Goshthi` held on the occasion. The Punjab empowered committee on power sector reforms today approved a strategy of unbundling of the state electricity board (PSEB) as mandated by the Electricity Act, 2003, and also gave green signal to the board to begin construction of stage-II of the Lehra Mohabat, Bathinda, thermal plant.